Editor’s Note: The following piece by Polly Woollcott Murphy was published in the Gazette on Dec. 2, 1983. Mrs. Murphy, who began writing for the Gazette in 1940 at the age of 17, died on Nov. 15 at the age of 86. This old house was indeed falling down. It had been standing for years among its trim, well-kept neighbors on Music street in West Tisbury, a sorry derelict of an earlier age. It had belonged to the late Ruth Brown, and was bequeathed by her to her nephew, Steve Murphy. Mr. Murphy grew up in West Tisbury, but complicated family situa­tions made it impossible for him to either tear it down or repair it. These situations were eventually resolved, and recently the house, long past repairing, wasdemol­ished by White Brothers in a single day. It was an event startling to residents of Music street. In the morning, the derelict house was still gamely standing. By nightfall, no trace of it remained. The narrow lot on which it had stood was as empty and raked clean as if it had never been there. No cellar hole remained as a memorial. There had never been a cellar, and the old well, lined with curved bricks, had been bulldozed over. Only an outdoor oil tank, pushed over to one side, proclaimed there had ever been a dwelling on the lot. The oil tank was anachronistic because the house had originally been built in the late 1700s at Deep Bottom Cove by Thomas Waldron, great-grandfather of the present Thomas Waldron. The house was moved to Music street, undoubtedly by teams of oxen, by his son, another Thomas Waldron, great-uncle of the present one. The front windows were removed before demolition of the house started. According to Richard Burt, a neighbor and an antiquarian, the windows were even older than the house, and rather more elegant than the building they graced. They had small handblown lights, with the charm of bubbly, uneven glass that the old process bestowed. When the bulldozer moved in, the house began to cave. Neighbors gathered to watch, perhaps relieved but also in sorrow, as collapsing walls unveiled ancient wallpaper and oddly cut doors and windows. Plaster dust filled the bright morning air, and an ancient piano lay helplessly on its back in the bushes, a silenced reminder of the instruments that gave Music street its name. The Chicken Coop play group was brought en masse to observe the event, and watched with awe as a whole house fell down. Some of the toddlers seem anxious, others gleeful at the destruction. The little boys were especially fascinated with the power of the bulldozer. Their elders watched, equally hypnotized. A number of people seemed bent on conserving pieces of the house. Mary Ferriera was determined to have the old bricks from the toppled chimney to floor a patio. Charlie Jarret, a young electrician from Vineyard Haven, happened to be passing by as the bulldozer started its work and decided his passing was"an act ofGod." He began snatching doors, dishpans and timbers from under the iron jaws of the machine. Not for himself, necessarily. He was quite ready to offer them to anybody who wanted them. He just felt the need to save what he could. 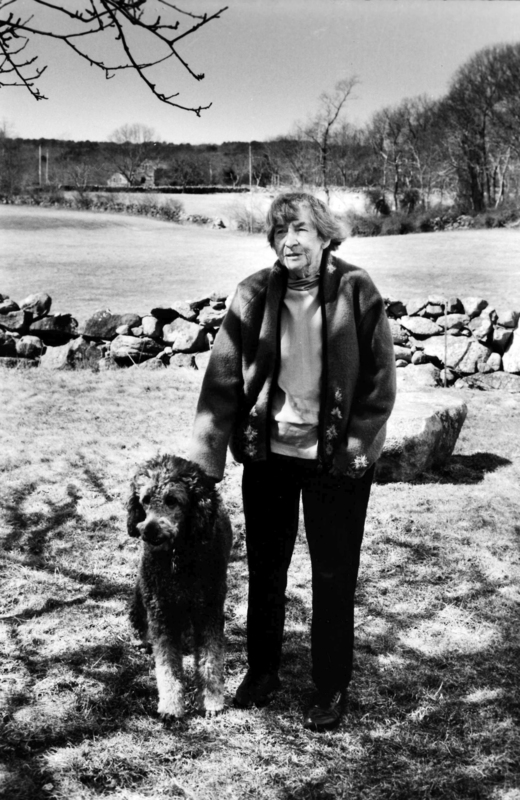 Leonard Athearn, whose hobby it is to chart the passage of West Tisbury's old houses, and especially their moving from one location to another, says that at the turn of the century the house was owned by a Waldron descendant, Nancy Adams, grandmother of Ruth Brown. She was the mother of Frank Adams, noted Island decoy carver and the maker of much sought-after weather vanes in the form of sailing ships of all kinds. In the small house on Music street Mrs. Adams took in boarders — school teachers and traveling salesmen — in the early years of this century. Mr. Murphy, who had owned the house, plans to rebuild another in the same lot before next summer. Benjamin Moore, the West Tisbury architect, has drawn up plans which reflect some of the spirit of the old house. Burnham and Magnuson of Edgartown will be the builders. But meanwhile the lot is empty, and should you pass by it some quiet night, you may hear the ghostly tinkle of a long silent piano playing the nostalgic strains of a requiem for an old house.